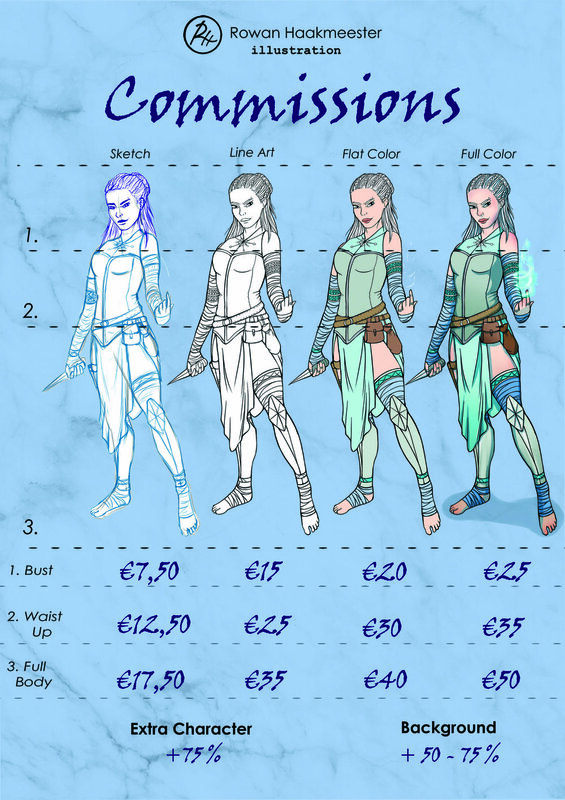 Interested in a commission? Make sure to read all the information below! Interested in something completely different than the above style? Don’t be afraid to ask! I’ll see what I can do in that case. Send your email to rowanartist@outlook.com, or use the contact page! So you're gonna design your character! Whoop, fun! To make sure you don't end up with a generic looking character, but one that has a visible story I need to know some stuff. The rule of thumb with character creation is storytelling. A plain face is not interesting, but a face with a scar on the eyebrow and a very specific earring is interesting. Where did he get that? What does it mean? Try to incorporate your backstory into the details of your character. Bringing characters to life is what I love doing the most, so enjoy the process!